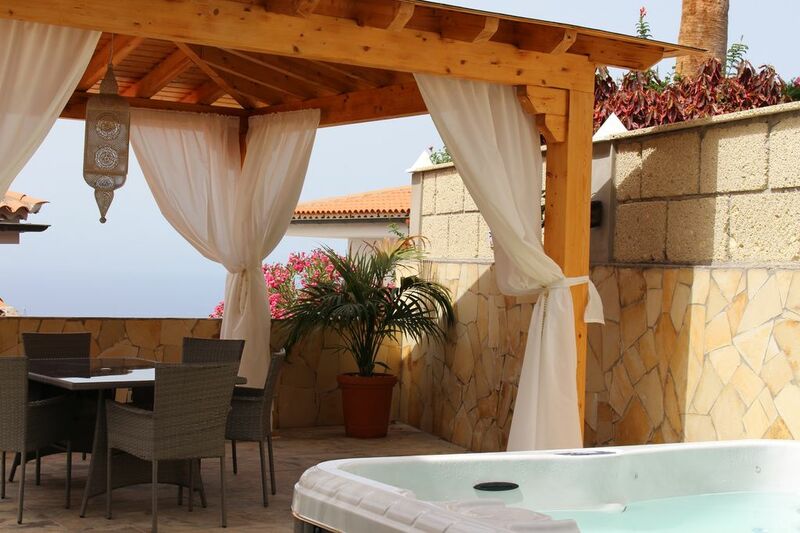 This very special spacious villa With mountain & sea views is set within the very pretty and tranquil residential village of Chayofa in the south of the Tenerife Island. The airport Reina Sofa is just a 15 minute drive from the villa itself. The villa has three bedrooms and two bathrooms. All rooms have been recently modernised as has the rest of the villa. A king size bed with bedside draws & fitted wardrobes. A double bed with bedside draw & a free standing wardrobe. Is two single beds draws & a free standing wardrobe. Has a walk in shower, wash hand basin, toilet & bidet. Has a bath with an over head shower, with a wash hand basin & toilet. The utility room has a washing machine & plenty of space to store your empty suit cases. The living area comprises of an open plan kitchen, lounge & dining area. The kitchen comes fully equipped & has a dishwasher. The dining room seats up to six guests plus there is also a high chair. Both dining & lounge areas lead out onto the lovely well kept garden with mountain & sea views. The garden has a beautiful gazebo where you may enjoy Al Fresco dining and there is also a barbecue for you to enjoy! In the garden we have a spa jacuzzi, the latest in design with massage jets for you to relax in by day & by night! There are sun loungers for all of our guests & parasols should you require shade. There is also a shaded seating area on the veranda. Although this lovely villa doesn't have a swimming pool, there is a pool very nearby you may use at anytime. The Villa comes with free high speed Wifi, including english & international television. In the village you will find a mini supermarket which has freshly baked bread daily & all the other little necessaries you may need. A five minute walk from the villa you will find a few quaint restaurant's, one of which is Finca Meson, this restaurant is a typical Canarian Cuisine with a lovely ambience for inside & outside dining with soft music & lights. Also in the village is The Treehouse which offers a full menu also with outside dining. La Tasca Bar is a place where you can indulge in a lovely Traditional Tapas lunch. The Country Club in Chayofa has a menu with a difference & also hosts a pool bar, tennis court's, & a gymnasium. There is a taxi rank at the Country Club if you don't have a car & you so wish to venture out of the village. Further up from Chayofa is a five minute journey to The Jungle Park. Here you will find some of the islands animals & spectacular shows of birds of prey. A short ten minute journey is the famous water park, Siam Park & is known as the best water park in Europe. This Park has star ratings on Trip Advisor. This water park hosts water splashes, a beach with waves & of course water slides for fun for all the family. The Camel Park is nearby where you can experience Camel Rides & there are also riding stables for those of you who are the equestrian minded. There is a fabulous boat trip to see the Pilot Whales & Dolphins & this really does come highly recommended. For those of you that enjoy shopping, Siam Mall is just a short journey away. Here you will find the likes of Zara, Mango, H&M, Guess, Pull & Bear, Pandora & many other Spanish Clothing outlets. There are also eateries in the shopping Mall for your refreshments. The Old Town of Los Cristianos is a ten minute drive away and, there you will find its wonderful beaches & also restaurants & bars are a plenty if you should require more lively entertainment. Playa De Las Americas is right next door to Los Cristianos where you will find the Safari Centre popular for its Nuevo Cuisine. There is something for everyone all to enjoy here in Tenerife. All bathrooms are provided with hand soap and bath & hand Towels, bath mats & non slip mats for the bath & shower enclosure. All linens are provided on arrival for the duration of your stay. If you should so require additional change of linen etc then there shall be an extra charge for this. There is plenty of parking outside the villa. We have one of the highest WIFI systems on the island. All bath towels are provided on arrival for the duration of your stay. If you should so require additional change of towels etc then there shall be an extra charge for this. The fridge is a built in housing all of your chilled goods and there is a separate freezer too. All pots & pans, plates, bowls, and glasses provided. The open plan kitchen has a light and airy feel. The kitchen comprises of a built in electric fan oven and built in microwave and separate gas hob. The kitchen has an attractive island & dining area. We have English and international tv. There is comfortable seating on the terrace. Smoking Permitted outside areas only please. The pool is situated in the nearby country club just a few minuete walk from the villa. The latest in design including 30 massage jets which can be operated to suit your requirements. Also in the village you will find a mini supermarket which has freshly baked bread daily & all the other little necesaries you may need. A five minute walk from the villa you will find a few quaint restaurant's, one of which is Finca Meson. A typical Canarian Cuisine with a lovely ambience for inside & outside dining with soft music & lights. Also in the village is the Treehouse who offer a full menu also with outside dining. La Tasca Bar is a place where you can indulge in a lovely Traditional Tapas lunch. The Country Club in Chayofa has a menu with a difference & also hosts a pool bar, tennis court's, & a gymnasium. There is a taxi rank at the Country Club if you don't have a car & you so wish to venture out of the village. Further up from Chayofa is a five minute journey to The Jungle Park. Here you will find some of the islands animals & spectacular shows of birds of prey. A short ten minute journey is the famous water park Siam Park, as has star ratings on Trip Advisor. Thankyou for your review, we really do value your opinion & are so pleased that you had a comfortable stay at the villa here in Chayofa. A quiet spot ,very relaxing place.Spacious villa with everything you need. Lovely villa away from the busy area along the coast. We have enjoyed the hot tub after a busy day. Very spacious villa with everything you need.we will be recommending it. Thank you very much for the lovely review and it was a pleasure to meet you all too! We are so pleased that you all enjoyed your stay here in Chayofa & we look forward to seeing you again one day. Best Regards Ria & Roger. We spent a wonderful week in this exceptional villa in a very peaceful location with beautiful sea and mountain views within the village of Chayofa which contains a small supermarket, adequate for self-catering plus 3 nice local restaurant/bars and a country club which a pool for public use. The owners Ria and Roger provide absolutely everything for a truly enjoyable holiday including wonderful comfortable furnishings, an outstanding kitchen and lovely bedrooms and bathrooms. The outside space includes smart comfortable living and dining facilities, pretty garden areas and a large hot-tub which was the highlight of the holiday. If possible we would give this more than five stars. Thank you Ria and Roger from the Alden family. Thank you for the lovely review it is very much appreciated. We are so glad that you had a lovely time here at the villa and that you had a lovely time with you visiting the island too. Also just to say... thank you for leaving the villa nice and tidy it helped me a lot. Lovely to meet you all take care. We (party of 3) had a wonderful relaxing week at this fantastic villa from 14th August 2018 and all I can say it the villa offers a real home from home feeling. It is extremely well furnished and spacious and had a very smart, relaxed feel. The bedrooms have loads of storage for clothes, cases etc... and there is a separate utility room with washing machine and dryer. One point to mention is that the WiFi is excellent and covers every inch of the internal and external space, which kept my daughter happy for the duration of our stay, whether it was streaming music, watching Netflix or browsing social media. The villa is approximately a 10 minute bus ride away (€1.40) or a short taxi ride (€8.00) from the hustle and bustle of Los Cristianos and Las Americas. This gave us just what we wanted, allowing us to step back and relax in the peaceful surroundings of Chayofa. Chayofa is a quiet residential area, but there are 3 restaurants to eat and drink if you want to stay local. We tried all 3 during our stay and all were competitively priced and the food was very good in all of them. Both Ria and Roger are very friendly and helpful with regard to advising what the island has to offer and they also provided an excellent welcome on our arrival. Thanks again for your fantastic hospitality and making our stay extremely enjoyable. Thank you for your review to us here in Chayofa. It was a pleasure to meet you and your family and we are very happy that you had an enjoyable stay at the villa.